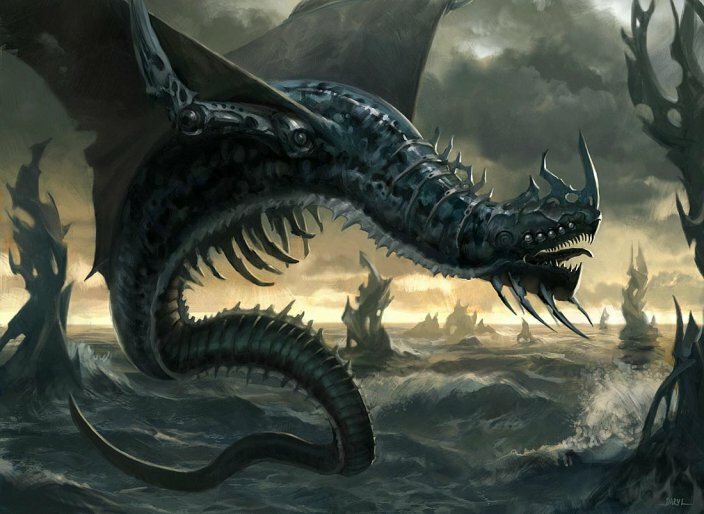 With the set behind us and the Event Decks about to be complete, we’re on the verge of leaving New Phyrexia for quite some time. Fitting, then, we’d go out with a bang and not a whimper, with two no-holds-barred aggressive options in War of Attrition and Rot from Within. I sat down across from Jimi to give the deck a proper field test. Here are the notes from this final engagement. Expectation can be a powerful thing. At its most fundamental, its a barometer of confidence that assesses the interaction of two things- a subject and its environment- and finds its fruition in their intersection. Will I get the job? Well, that depends- how good of a candidate am I, and what are the company’s needs? How good are the others applying for it? Will Johnny pass his History exam? Now much effort and aptitude has Johnny shown for the subject matter, and how difficult is the test? Will I win tonight at Friday Night Magic? Well, how good is my deck, and what is my meta? As humans we are constantly in a process of setting and refining expectations. If insanity is doing the same thing over and over and expecting different results, as is often apocryphally attributed to Albert Einstein, perhaps then we can define wisdom as the reassessment of expectation in light of new evidence. If that’s so, then we can credit Wizards with a bit of wisdom in their treatment of New Phyrexia’s Event Decks. 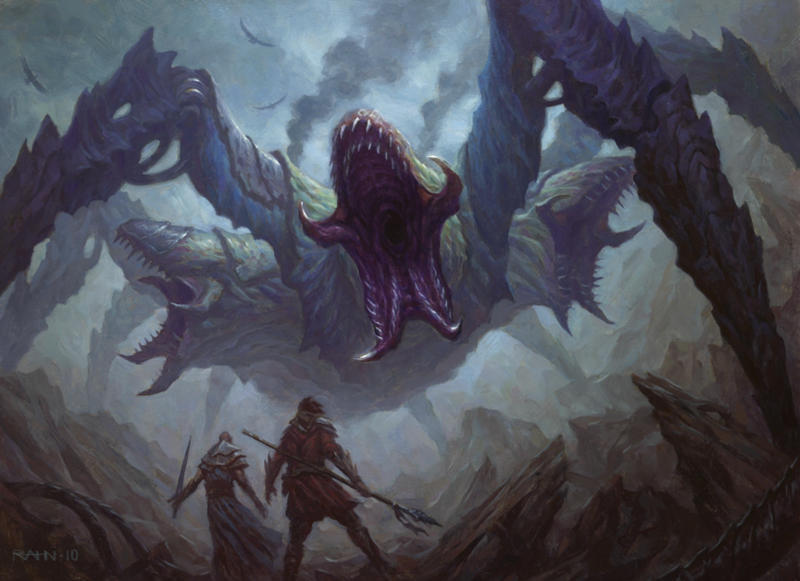 Did Into the Breach and Infect & Defile take the world’s FNM’s by storm? Hard to say in the absence of documented evidence, but given how little anecdotal groundswell there has been in that direction, it’s probably safe to say that they didn’t quite live up to their expectations of making their wielder “immediately competitive,” a quote taken directly from the back of the box. In learning from this, Wizards was presented with three options. First, they could improve the decks to meet their desired outcome. Second, they could decrease expectations. And third- the default option- they could do nothing. It would seem that Wizards has taken the path of the first two. As mentioned in our review of War of Attrition, the decks took what worked the last time- speed- and made it a defining characteristic of both offerings this time. The midgame positioning of Infect & Defile- easily the weaker of the two Mirrodin Besieged decks- has found no successor here. Rather, we’re treated to two decks that acknowledge that a rapid-deployment strategy offers inferior decks the best chance of victory against those of higher quality. One wonders briefly if this realisation condemns the Event Decks to being a pair of aggro decks released every set, but that is a question whose answer won’t be revealed for some time. At present, we have but the two sets’ worth. Event Decks let you jump into tournament play with a powerful deck that will give you a fighting chance. With the reviews written and the stage set, it is time to pit Event Deck versus Event Deck and see how they play against one another. As we saw, both decks have embraced a speed-kills mentality. To crib a little Thomas Hobbes, every indication points to these matches being nasty, brutish, and short. One controvertial decision we made during the last round of Event Deck playestings (for Mirrodin Besieged) was to forego a sideboard, and we’ll be repeating that choice here. 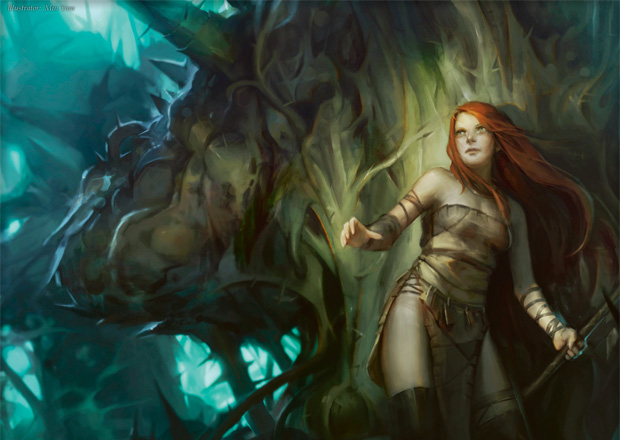 Although sideboards are indisputably a critical element of constructed play, there are two reasons for our decision. First, as precon players we’re perfectly happy to see how the ‘stock 60’ stands up- we’re looking for overall performance of the deck moreso that how it manages to outmaneuver a specific opponent. A worry here is that one player might skew results by happening to draw a couple of their sideboard options and gaining considerable advantage. This is the point of a sideboard at the constructed tables, of course… but perhaps a little less so here, when we want to see how the list stands up on its own. The second reason is unfamiliarity with the concept. If Event Decks are to be the gateway to competitive play, they’re going to need to do a better job of coaching players on how to manage a sideboard. Because of the level of skill it requires in making decisions- both what to put in, and perhaps more critically what to take out– there is a high level of intimidation factor. Not all in the Ertai’s Lament crew are as comfortable with the concept, and so setting the sideboards aside is the better option. There is a minority opinion here (read: mine) that holds that sideboards are actually part of the deck, and that a thorough testing should include them. It’s something we’re working on with our skill levels, and I should expect that by the next set of Event Deck reviews, we’ll have full integration for testing purposes. Until then, we can only hope that you’ll enjoy our review of the stock decks, and on that basis get an idea of what they are capable of right out of the box. Here are the game notes from our matchup. Finally, we’ve arrived at the final game for New Phyrexia. 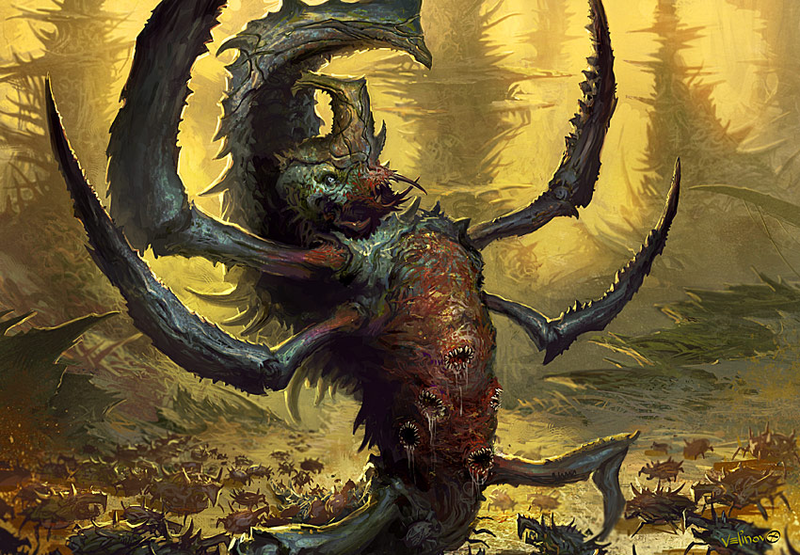 We’ve seen a Phyrexian mana-based deck, a tribal Golem deck, a removal deck, and a skies/equipment deck all represent the block, at last it’s time for the infect/proliferate. Ever bold, Jimi selects the tribal deck- Artful Destruction– to serve as opposition, and after a few shuffles and a die roll, we’re off! At last, one of the set’s most anticipated intro decks shakes off its plastic casing and gets shuffled up in the field of battle. 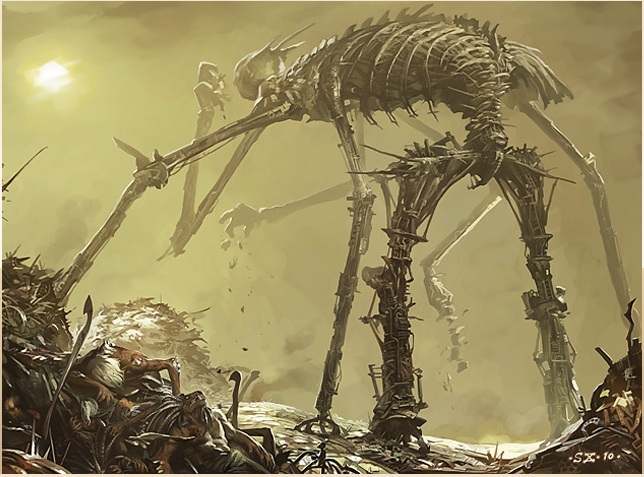 The flagship deck for the Phyrexian mana mechanic, Life for Death promises to be a deck quite unlike most any we’ve seen before. Boldly standing in its way is Jimi, who has opted to pilot the Devouring Skies deck. 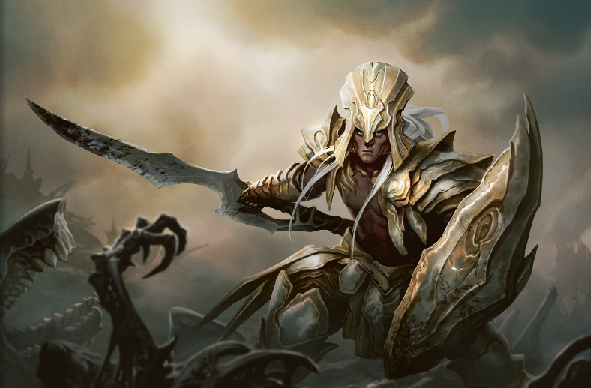 Will its air force and living weaponry have what it takes to put this Boros deck to rest? One of the great enjoyments from the third set in any block is seeing how they mechanically represent the end of the line. Unlike the first set, where the introduced main mechanics can be fleshed out as the block goes on, the ones in the last set are assigned to have a rather more limited shelf-life. When exalted and unearth were launched with Shards of Alara, you got to see how they were tweaked in Conflux. 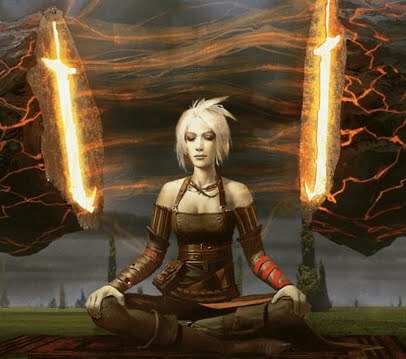 Not so for Alara Reborn’s cascade– there, what you saw was what you got, and barring a future revisit of the mechanic, that was all you were getting. 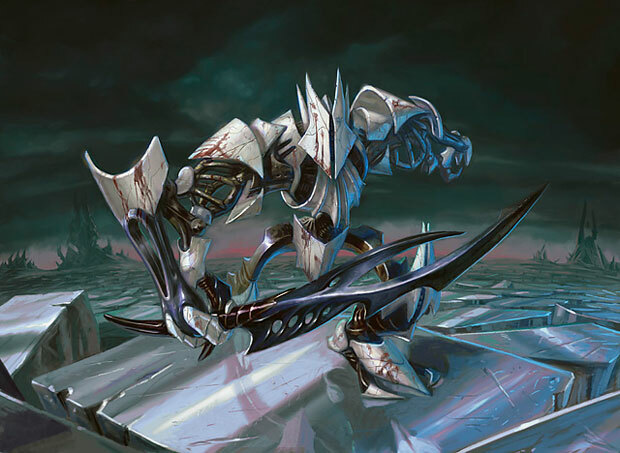 Scars of Mirrodin brought a new crop of mechanics to the fold. Metalcraft loomed large early on, but has faded with the declining fortunes of the Mirrans. 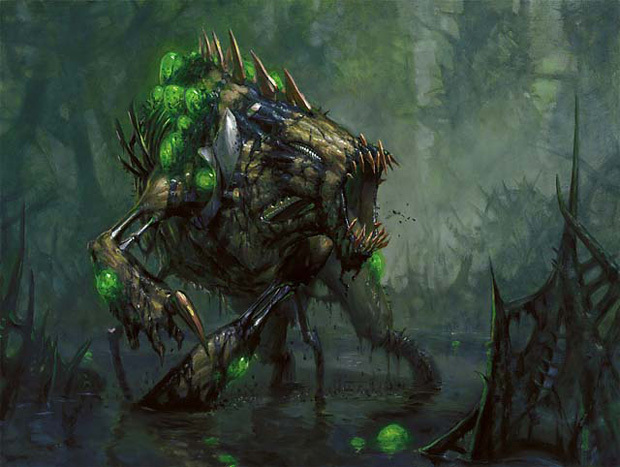 Meanwhile, infect– one of the Phyrexian’s mechanics- has been added to, layer upon layer throughout all three sets. 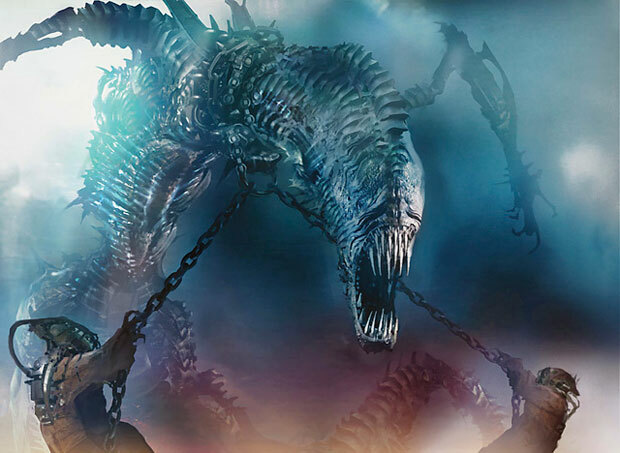 As they say, to the victors go the spoils, and the new mechanic for New Phyrexia is very Phyrexian in both flavour and function: Phyrexian mana. For today’s epic matchup, Jimi selected Feast of Flesh to challenge my Devouring Skies. Feast is one of the most removal-packed decks in recent memory, though as we saw in our playtest of the deck its selection is a bit erratic and conditional, applying a bit of an artificial choke on the deck’s power. Still, there was more than enough killpower to give the creature-focused Devouring Skies a run for its money. 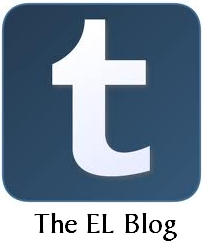 Here is the writeup from the customary trio of games we played.